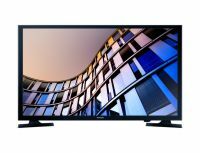 If you have been thinking to buy a new smart television, then the latest Samsung M4100 Series 4HD TV is the one you should go for. The latest technological advancement from the house of Samsung is this next generation smart television that every household deserves. This is one brilliant product with elegant design and futuristic smart convergence features. This TV allows you to have a clear and detailed picture quality with an enhanced audio output. To Recieve updates and possible rewards for Samsung UA32M4100ARLXL please sign in. To Recieve updates and possible rewards for Television please sign in.